Have you gotten over a cold, but can’t seem to shake a lingering cough? Here’s a simple solution to stop coughing sooner even if your cough has been persisting for days or weeks. 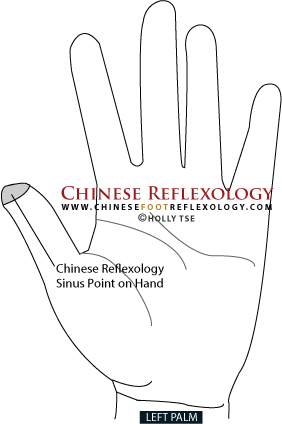 This two-step Chinese Reflexology routine is also great for a lingering cough caused by post-nasal drip. A few weeks ago, I shared a past article on my Facebook page. The article was on How to Get Over a Lingering Persistent Cough and a Post-Nasal Drip Cough. The mini reflexology routine in the article worked like a charm for many readers! Since I first posted the article, many people (including many moms) wrote to let me know that the article helped them get over a persistent cough, sleep better because they weren’t waking up coughing, and also helped their kids get over coughs that had been lingering for weeks. For the mini reflexology routine, all you had to do was massage two foot points every time you coughed. Sounds simple right? However, there was one thing that I hadn’t considered when I wrote the article—and a reader kindly and astutely pointed this out to me. For many people, it’s not convenient to massage your feet every time you cough. As a full-time mom and entrepreneur, I’m always walking around the house barefoot because I work from home. I also live in California, so when I did work in an office, I wore flip-flops most of the year. Therefore, it never crossed my mind that most people going about their daily activities are wearing shoes—or they’re surrounded by other people, or they’re standing—and they can’t take their shoes off to massage their feet every time they cough. Whoops. My bad. A reflexology routine for a persistent cough isn’t very useful if you can’t rub your feet. There are reflexology points on the hands that people could use instead. You can easily, conveniently, and discreetly massage your hand throughout the day. One thing I do want to mention though is that the foot points are much more powerful than the hand points. In Chinese Reflexology, the points in the feet are considered the “master control” points for balancing the body’s energy meridians. However, I always say, some reflexology is better than no reflexology. So for those times when you can’t massage your feet, massage your hands! Then when you’re at home and you can take your shoes off, practice the points on your feet. 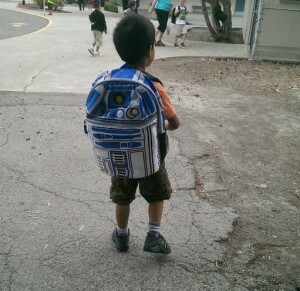 Here’s my son when he was five with his giant backpack. Now, he’s twice the size! I’m surprised I didn’t think of this sooner. I use the hand points all the time. When I walk my son to school and it looks like he’s on the verge of catching a cold, I’ll massage his hand reflexology points as I hold his hand. Even though he’s seven years old, he still lets me hold his hand sometimes when we walk to school. Lucky me! I know, I know. At some point, I’ll have to cut the apron strings. But for now, I’ll treasure these moments for as long as I can :). Lol, I tell him that we have to hold hands while crossing the street. Then he forgets I’m still holding his hand, so I get to hold it longer. I’m sneaky, hehe! 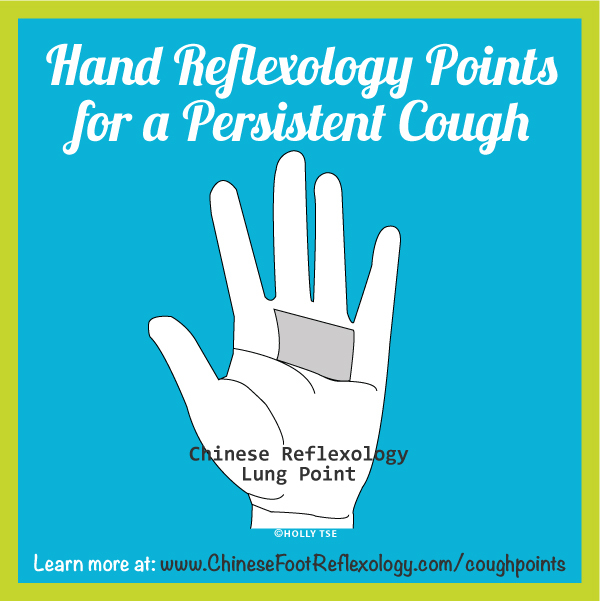 The hand reflexology points and mini reflexology routine are good for helping you get over a persistent lingering cough that is leftover from a cold or flu. At this point, you’re over the cold or flu, but you still have a residual cough that you can’t seem to shake. These reflexology points are also good if you have a post nasal drip cough leftover from a cold—especially when you’re in bed at night and you wake up coughing because of the post nasal drip. If you still have a cold, I’d recommend checking out my 5-minute cold remedy reflexology routine. And if you’ve got something more serious than a common cold, please see your health practitioner. Location: This point is located on the upper portion of the palm, underneath the three middle fingers. 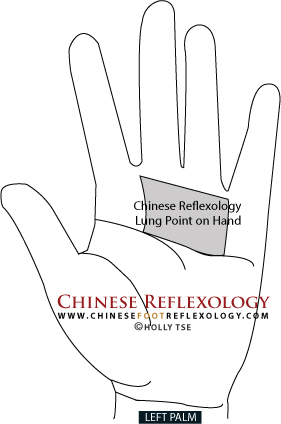 There’s a Lung reflexology point on both of your hands—the left hand is for the left lung, and the right hand is for the right lung. How to massage: To massage your Lung reflexology area on the hand, press into the point with your thumb and massage in small circles. Make your way across and down the reflexology area. If you remember typewriters :), it’s like you’re typing across the row, hitting the carriage return, and then doing the next line. I guess that’s a lot like using the computer to type too, so you don’t need to remember those old clunky typewriters! Location: The sinus hand point is located on the tip of the thumb pad of both thumbs. How to massage: Use your other thumb to massage the tip of your thumb in a side-to-side direction, from the left side of the thumb to the right side, and back again. The hand points are not as powerful as the foot reflexology points, so practice this routine when you’re on the go, at work, or unable to massage your feet. When you can rub your feet, practice the points on the feet as described in this article on How to Get Over a Lingering Persistent Cough and a Post-Nasal Drip Cough. Well, there you have it: a simple and handy routine to help you kick that persistent cough to the curb. And in conclusion, I’d like to thank the reader (you know who you are) who pointed out the need for a more convenient routine when you can’t massage your feet. Last year, my blog had close to a half million visitors. That adds up to a lot of comments and emails from readers. Because of the volume, I can no longer respond to everyone individually. But I do read what you write—every single email and comment—so long as Facebook doesn’t hide it somewhere! I consider your words when deciding which topics to write about and what to cover. So I just wanted to say thank you, and please keep those comments and messages coming in. When I have some free time (all the moms reading this are LOL and ROFL) I respond when I can. If you do hear from me, think of it like spotting a unicorn! All joking aside, your words help me create content that’s useful for everyone. Thank you. Thank you very much. And Elvis has left the building :). Wait a sec, Elvis is still here. 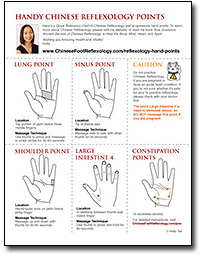 I forgot to tell you about a handy hand reflexology chart that you can download for free. Discover points to massage for headaches, additional points for colds, shoulder pain, constipation, and more. Click here to read about the hand reflexology points and fill out the form below to get your free hand reflexology chart. Get a free Quick Reference chart of the reflexology points in this article by entering your name and email below. You’ll receive a PDF of the chart, free Chinese Reflexology foot charts, complimentary mini lessons on Chinese Reflexology, and my monthly newsletter. It’s a fun way to learn self-healing tips and techniques for the body, mind, heart, and spirit. I tried this on my husband who currently has a persistent cough – it worked! He coughed a lot less after. I try to share your website every time it pops up. Your knowledge needs to be share with everyone. I don’t teach much anymore but I did teach 5 different modalities for about 35 years.